Monica Whitman grew up watching Miss ULM. From Kathrine Colombo, Miss ULM 2007, to Amy Medlin, Miss ULM 2013, Whitman has been following the pageant her entire life and her dreams of following their footsteps strengthened with time. 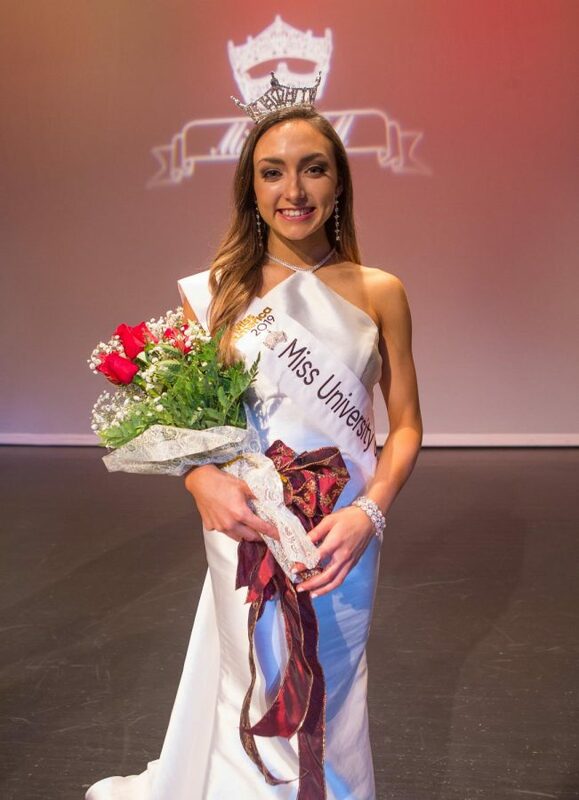 Her childhood dreams finally came true last Friday when Whitman was crowned as the 66th Miss University of Louisiana at Monroe. “I grew up watching Miss Louisiana and watching Miss ULM, because I always knew I wanted to go to ULM. To finally have this title and serve this university is awesome,” said Whitman after winning the pageant. Whitman is a junior pre-pharmacy major. Due to academic reasons, she had been putting Miss ULM on hold for the last three years. After getting accepted to pharmacy school this year, there was nothing stopping Whitman from going after her childhood dream. “I think coming into this she knew this was kind of her only chance and she rose to the occasion. She couldn’t have done any better,” said Megan Lee, executive director of the Miss ULM pageant. The new Miss ULM is no stranger to the pageant world. Before participating in Miss ULM, she had participated in different preliminaries. Whitman competed in the teen category when Lee was competing in Miss Louisiana. Lee watched Whitman grow up and develop over the years and thus, could clearly see the “hunger” in Whitman’s eyes this year. “She really wanted this job and this title. She came prepared to win,” Lee said. Regardless of the familiarity with the pageant world, the path to the crown wasn’t an easy one for Whitman. The most difficult part of the competition, for Whitman, was the talent round. She performed a contemporary dance number as part of her talent. Having little experience as a dancer, Whitman shared that she struggled a lot while preparing the dance. “No matter what she does, from sports to school, she always prepares and practices, because she’s a competitor. She was the most prepared that she could be,” Angie said. “ULM is so good to their queen. So, that’s what excites me as a mom that they take care of their contestants so well. The mom doesn’t have to you know do quite as much,” said Angie reflecting on Whitman’s win. Her want for the title and the effort she put towards winning was evident to everyone near and close to Whitman, including her Kappa Delta sorority sisters. “She has worked so hard. She was very nervous about her dance last night, but she did absolutely fabulous. This is the best I’ve ever seen her do her dance,” said Alyssa Garner, Whitman’s grand-big in Kappa Delta sorority and Miss Heart of Trenton 2019. Taylor Moneaux, one of Whitman’s best friends, was helping her prepare for the pageant’s interview section till the morning of the pageant. “Because I’ve known her for so long, I can attest that she lives that [healthy lifestyle] every day. She’s incredibly physically fit, and I think that she’s going to be a great representative for the university and spreading that [message] across campus,” said Lee about Whitman’s platform. “She’s the person you can call at any point of the day and she’ll pick up. She’s the person that got your back,” Garner said. “Ever since freshmen year, ULM has just taken me in and just the whole aspect of ULM and the family environment of it, I absolutely adore. I love being a Warhawk,” Whitman said.